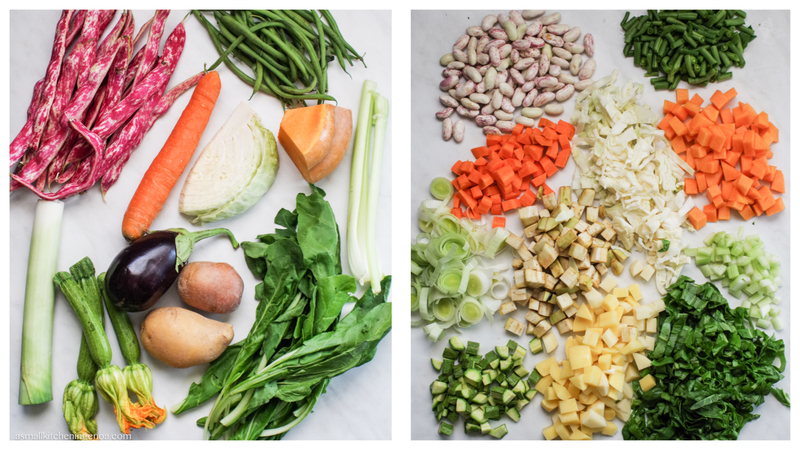 Minestrone soup:golden rules to make the real Genoese one. Autumn has arrived. Really? Actually I think I’ve seen him passing away. A courtesy visit, maybe. A couple of days ago, just the time to mess up the fronds of the trees with a blast of chilly wind and drop some leaves.Just the time to pull out the jumper out of the closet with enthusiasm, to roll a soapy scarf around the neck and to prepare – with the calm that only cold outside the window can give – a warm and comfortable soup. I prepared Genoese minestrone. 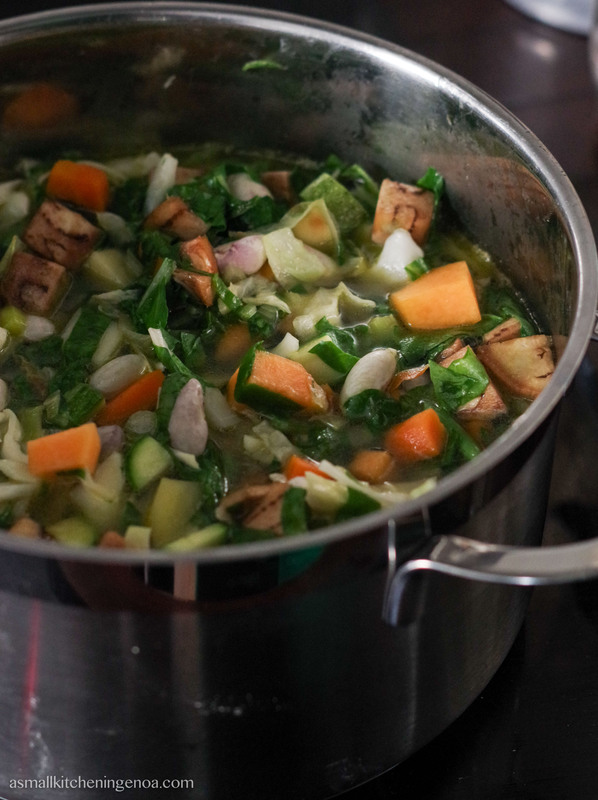 I know, it is a soup that is at its best on spring time, but it’s part of our family cooking stories and if there is a soup that gives me comfort, makes me feel protected, cuddled, at home, it is indeed minestrone. I think this is a great emotional asset to be handed down to my son. So as soon as the first cold wind blew I warmed my family with a minestrone made with love. But let’s not just talk about me and the quick appearance of autumn, let’s talk about minestrone, its history and how to prepare it. Perhaps you don’t know that if our fresh vegetable soup is famous all over the world it is thank to the sea. In fact, in the Genoa port – where for centuries thousands of ships coming from all continents moored each year – there used to be the so called “catrai”, small floating restaurants arranged on boats or on small barges. At the well-known call “Eooh!”, catrai used to offer steamy bowls to sailors sticking their heads out of the vessels boards. The menu included fish soups, tripes stew and, big hero, the minestrone, which with its green freshness was of great comfort after long periods spent on board eating crackers and salted seafood. Sailors then went back to their far away homes with the memory of that soothing veggie soup and a vague recipe in their mind. 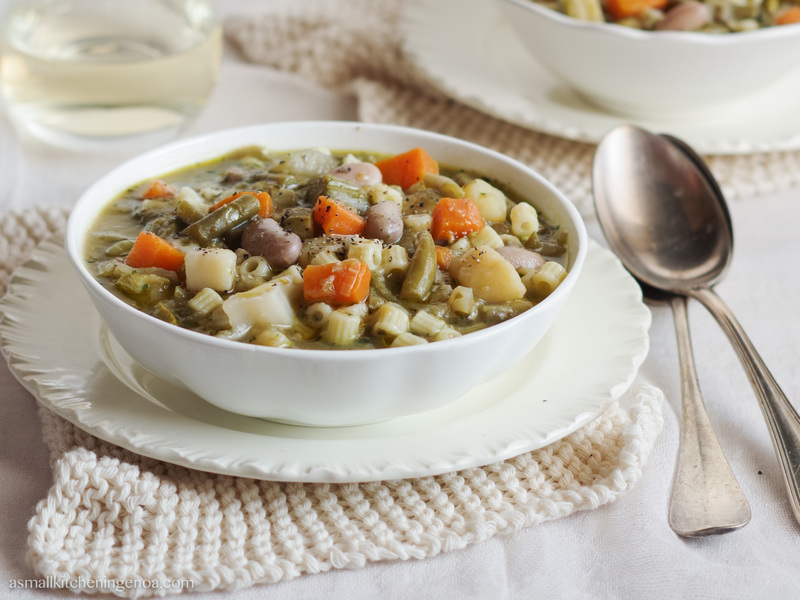 Minestrone, however, was born as a home dish, a dish served at dinner, after a long day of work when eventually all the family sat around the kitchen table. 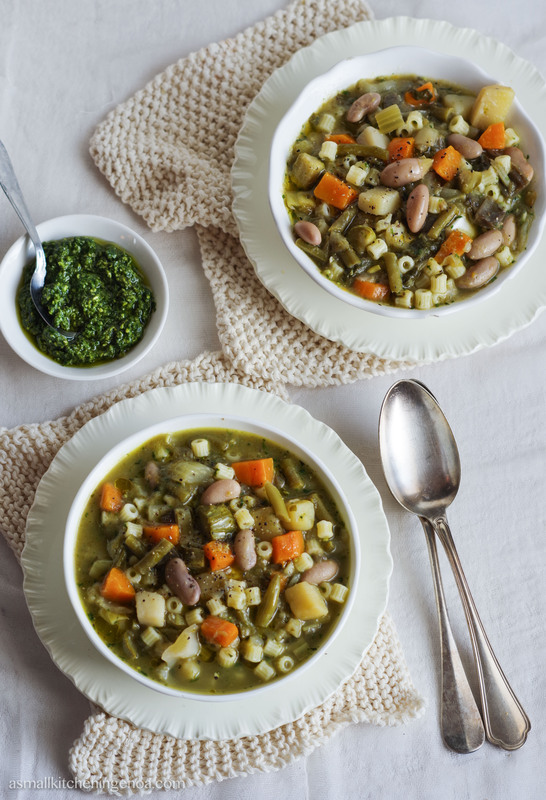 A standard recipe does not exist both because minestrone was made with seasonal vegetables, the ones at disposal, and because every family had their own habits and tastes. 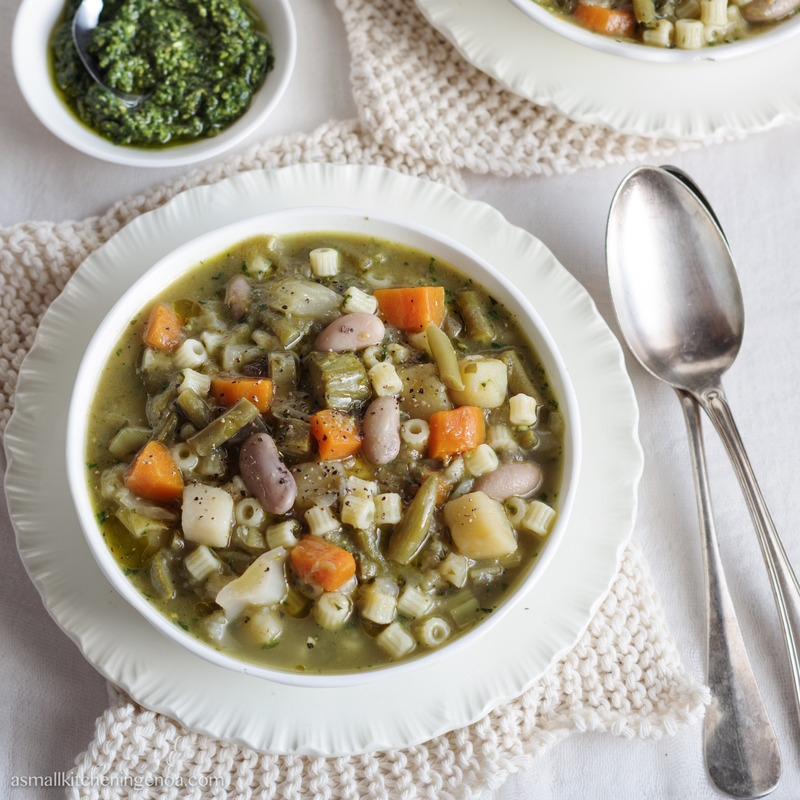 In general, in spring minestrone was more varied and it was enriched with a basil pesto, in winter, when basil was not there, the few seasonal vegetables were seasoned, only once cooked, with a soffritto of onion and parsley. First of all minestrone is a soup that cooks at low fire for a long time. Boiling vegetables nearly have to melt and the suop shall dry out little by little. It is said that a spoon stuck in the center of a minestrone bowl should stay upright … maybe it’s too much but the final texture indeed should be thick and creamy. The traditional minestrone calls for no initial soffritto differently than many other Italian soups. All vegetables, cubed, are boiled just in water, slightly salted (no stock needed). Inevitable, then, is a piece of parmesan cheese crust, well scraped, to be added halfway through. Cooking slowly it softens, dissolves and releases all its flavors. Minestrone is born as an all in one course and therefore it calls for pasta, to be added at the end of the cooking, possibly adding a glass of water if the soup is already too dense. In Genoa there are a couple of traditional pasta of durum wheat semolina specially conceived to be cooked in the minestrone because they are small, very thick and don’t overcook: they are scucussun (a cus-cus extralarge version) and bricchetti (short pasta matches, alike broken spaghetti). The last touch, the one that gives the fresh Ligurian flavor to the dish, is the final addition of pesto. Be careful however, a basil pesto made without pine nuts and that should be added only when the pot is removed from the fire. Pesto, in fact, must not boil so keep it sparkly green colour and release all of its “raw” fragrances. Finally, tradition rules that minestrone have to be served after a fifteen minutes rest in the bowl, better if made of terracotta. In summer we eat it even the next day, at room temperature, and it is fantastic too. And now, this is the recipe that I prepared a few days ago. Shell the borlotti beans and collect them in a bowl. Rinse zucchini, green beans and carrots and cut them into equal cubes. Peel potatoes, pumpkin and eggplant and cut them in equal cubes as well. Slice leeks, chards and savoy cabbage and add them to the other vegetables. If you wish to cook minestrone in another moment, collect all the veggies into bags and put them in the freezer. Pour the vegetables - fresh or frozen – in a pot, cover with 2 fingers of water, stir and cook on law flam for about 30 minutes. If you use canned beans add them now. Add the parmesan crust in the pot and cook for other 30 minutes. If it is too dry add more water. Scoop out two ladles of minestrone, blend separately and pour in the pot. Pour the pasta and cook until the pasta is ready. If it is too dry add a glass of hot water. For preparing the pesto rinse and dry very well the basil leaves. Preferably in the mortar (or in the blender) smash the basil and garlic (if you use the mortar help yourself to smash with a couple of rock salt gains). When they have become a cream add parmesan cheese and stir. At the end add a couple of tablespoons of extra-virgin olive oil and stir manually. When the pasta is ready pour the basil pesto into the minestrone, stir gently, scoop into a bowl, wait for 15 minutes and then serve. Another traditional Italian Riviera soup, very popular and easy to prepare is the so called “Zimino di Ceci” a chickpeas-and-chard-soup. Have a look and try it! If you, like me, are always looking for inspirations on soups to cook (and how to style them in the plate, … eh eh) have a look at my pinterest board “|SOUPS| Comfort Healthy Food“, there you will find delicious recipes from all over the world (wonderfully shot, useless to say).